Damian and I like to start our warm-weather weekends right, with our ritual trip to the Saturday morning Farmer’s Market. We have this ongoing challenge (it begins anew each annual market cycle) where every week, along with all our produce staples, we choose one unique. We try to choose something special and in-season, but it can range from as elementary as boysenberries to as alien as fiddleheads. It’s an awesome game that keeps us excited and trying new things. So far this year we’ve done mustard greens (new favorite! ), asparagus, and . . . fennel bulb. Fennel is a Mediterranean herb that shares a flavor profile with the likes of anise and tarragon. It’s also the secret seasoning in Absinthe! Truth be told I’m not a huge fan of black licorice and its kin, but fennel is the mellowest of the family and really quite nice. And here it adds an interesting layer to this old stand-by soup. Special thanks to S for inspiring this dish! Cube the potatoes and spread them in a single layer on a baking sheet. Bake at about 350º for about 15 minutes, or until they’ve just developed a bit of a ‘skin’. In the meantime, rough chop all the veggies. Sauté the fennel, mirepoix, garlic, and olive oil in the bottom of a soup pan, until the onions are glassy. Transfer to a food processor or blender and add 2 cups of water/veggie broth. Blend until smooth. Pour the blended mixture back into the soup pot over medium heat. Add the split peas, spices, bay leaf, and potatoes. Cover with the remaining 6 cups of liquid and bring to a boil. Reduce heat, cover, and simmer until split peas are very tender (30-40 minutes). Add more liquid if needed. Season to taste. Serve with fresh cracked black pepper. 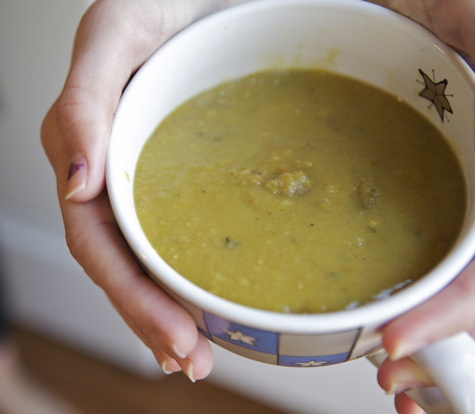 Enjoy this last little bit of soup weather, before it’s too hot to even imagine it! Do you use all of the fennel or just the bulb? Do you think adding the tops would overwhelm the flavor? I tried to cook with fennel twice last year and I didn’t find the love but I’m willing to give it another shot. Place oil in a 3 quart pot on medium heat. Add leek, garlic and fennel, cook for 3 minutes, stirring frequently. Add potatoes and water and cook until soft, approximately 20 minutes, stirring occasionally. Add soy milk. Remove from heat and allow to cool 10 to 15 minutes. Carefully blend in batches, filling the blender half way. Return to pot, add seasonings and stir well. I’m actually excited for summer, because I’m going to experiment with more cold soups this year. One of our favorite soups is a zucchini soup. When we lived in Arizona I would make it in the winter & serve it warm because that’s when it was in season. Here in Washington it’s in season in summer & it tastes great cool too! My 8 year old son LOVES fennel bulb! When our CSA share pickup included fennel, he would nab it right away and eat the long stalks on the way home! Our new CSA season begins again in a few weeks, and I can. not. wait. My favorite way to eat fennel is roasted. Cut off the green parts of the bulb and cut each bulb into sixths, cutting through the core to keep the wedges together. 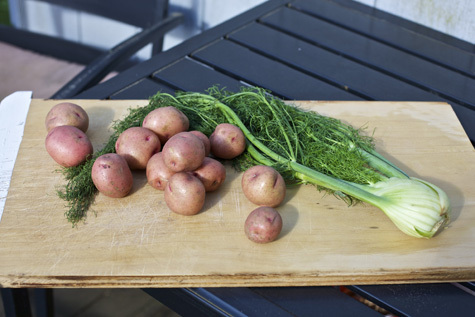 Slice some fingerling potatoes in half lengthwise and toss potatoes and fennel with olive oil, salt and pepper. Then roast in the oven until crispy and delicious! @ Theresa – Sorry if that was unclear – just the bulb! You could add the tops but it would definitely be strong. ‘Overwhelm’ is a matter of taste I suppose. You could try it? Let me know if you do! @ Kelly H. – YUM! That sounds great, thanks! @ Valerie – Me too! I want to master gazpacho this summer. There’s a raw food restaurant here that’s always got some amazing cold soup special. Best I ever had was watermelon-tomato-jalepeno. SO GOOD! @ April – CSA’s are so awesome, I really want to join one some day (never have all the money all at once . . . some day!) How lucky you are that your little one is a fan of veggies! @ Merideth – Mmm, sounds delicious, thanks for the tip! I LOVE fennel. I don’t tend to find that the fronds really add much flavor, so I usually use ‘em so they don’t go to waste. I really like just chopped fennel bulb in onion sauteed in olive oil with salt and pepper. This was a step in another recipe I made once and was soooo good. Do you pre-soak or pre-cook the split peas? I want to make this soup tomorrow! Sounds yummy! @ Meghan – Good to know, next time I’ll throw them in too. Thanks! I made the soup. It tasted pretty good! I soaked the peas overnight. Wow, it made a huge batch! We had some for supper that night and we brought it for lunch all this week, plus we froze a glass container of it! Probably made 14+ meals! Your picture looks like you put all of the ingredients in the food processor. Did you process the peas and potatoes? I have never cooked fennel or split peas before! Thanks for the recipe, I’d definitely make it again this fall! Made this soup last night…oh my cow it was yummy! Hubby is very happy! He LOVED it! Thanks for sharing! @ Hope Hughes – Yay! So glad you and your husband dug it!